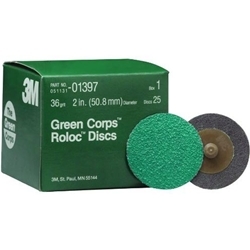 3M Green Corps Roloc Disc, 1397, 2", 36YF BOWES 3M 01397. Brown button. Generally used for hard to reach areas in paint, rust, and weld removal. Handy quick change tool for disc grinding which fits any standard 1/4 in drill or air tool.